This fabulously designed park bench will compliment any setting, and it's so comfortable, you won't want to leave! Our oh so popular Malibu park benches have become a fabulous hit! Perhaps it's because they offer such tremendous features at such a low cost. Style, durability, function and absolutely no maintenance! All this, and simple assembly make it a great choice for any environment. Sizes ranging form 4' to 6', there is one to accommodate your seating needs, and your budget. The colors are handsome and sure to fit your setting. The contour of these benches make it our most comfortable bench, inviting folks to relax and enjoy. Malibu benches have black legs and available seat colors are Cedar (butterscotch), Green (forest green) Gray (cement), Brown (milk chocolate). Most benches are available with engraving! 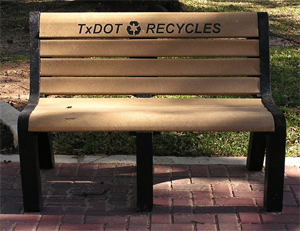 Personalize your bench for dedications, memorials, identification, advertising, or whatever reason you like. Engraving or Plaques for memorials, dedications, ownership, etc. Call for details. Legs are black but different colored legs are available on large volume orders. 19″ seat depth by 48″ or 60″ or 72″ width. 19″ back height by 48″ or 60″ or 72″ width. Seat is 17.5″ above ground level. Call 608-423-9800 or Contact us online today about our complete line of park benches, picnic tables, lumber, trash receptacles, planters and traffic control devices.